In the world of creative manufacturing, most companies create a product and go about finding a way to sell as much of it as they can with the least amount of effort and cost involved. Cody Turkey Calls is not like most companies. Since the beginning of the company's founding, Cody has created much more than a product. It has become a standard in the turkey call industry, it has changed time and again how calls are engineered and manufactured, it has created a following and it has become a legend. At an early age, Bill Zearing's love for the outdoors began in the wooded homestead of his youth. Much time was spent in the outdoors, and hunting was a way of life. By the age of 6, he was using a bow and rifle proficiently. Living without substantial means though, meant that the opportunity to purchase all the products he desired to equip his hunting arsenal was not possible. As he aged, a desire in him grew to have the tools of an outdoorsman. Bill had always been mechanically inclined and his hands-on spirit gave him the opportunity to fulfill his own wants. As a young teenager he built his own flintlock from scratch, without the help of a kit. This project and others honed his skills as a craftsman. As Bill became a man, that craftsman's spirit followed him into a life of construction and the daily grind, but the outdoorsman lived on. His first foray into turkey call creation came from a desire deep within him to create a call better than he could buy. He had tried many products in the field and he was sure he could make a better call. The roots of his outdoor life and his ability to fulfill his own needs came to the forefront once again. The synthetic and plastic pot calls on the market had no soul and like a good violin or guitar, Bill knew a quality turkey call should be made from wood. The question was how to create it? In 1981 the idea of building slate and glass calls with wooden pots went from one man's dream to reality. Hours of extensive work on the tailgate of a pickup truck and a workshop gave birth to a new breed of turkey call. Bill created the methods and designed the machines that would create the only true laminated wood pot calls in the industry. He perfected this two-month, twenty-five step process over the years, until it has become a science. The World Class and SPEC I pots have grains of wood running circular around the call. This process created the Cody World Class, the granddaddy of all wood pot calls. These calls dominated world competition in the 1980s and early 90s, turning world class callers into world champions. In the mid-1980's, backed by larger call companies as their sponsors, world champion callers began secretly using Cody Calls in competitions and by 1992, 13 of the 17 competitors in the World Friction Contest used Cody Turkey Call products, further cementing the reputation of an unmatched call and an untouchable sound. The same technology perfected in the Cody World Class call can be found in the Cody II, a walnut one piece pot in glass or slate. In the late eighties, Bill started building a call based on the Cody World Class pot and employing a wooden sounding board. This never-before-seen technique created the Cody SPEC I. After several years of testing, the SPEC I emerged as the toughest Cody call to build...but it was worth it. In 1993, the Cody SPEC I was ready for production. The first calls were slate only, and the glass version appeared a few years later, but it didn't take long for imitation calls to hit the market. These calls lacked the strength, beauty and sound quality of the world class products Bill and the team at Cody took years to perfect, and true turkey hunters knew the difference. Through the years, from the tailgate of a pickup to the nearly 5000 sq. ft. production facility nestled in the rolling foothills of central Pennsylvania's Appalachian range, Cody Turkey Calls has created a quality product and instilled a tradition of excellence into each product that it has rolled out. The process is still handled by the finest turkey call craftsmen the world has ever known, and all calls are hand crafted from the finest materials available. Cody Turkey Calls controls more aspects of the call building process than any other company in the industry. In fact, Cody controls many factors in the creation of its calls before the building process even begins. Owning lands filled with prime eastern hardwoods begins the process. Bill and his team harvest the trees themselves, selecting the finest for a sole purpose. The trees are then taken to the Zearing's small sawmill where they are carefully cut, selecting the grain of woods that best suit the needs of the various calls they are creating. Cody also handles the kiln and/or air drying process of all the wood. This is an integral part of the call's creation and it ensures a quality in the wood as the process advances into the multi-step finishing. For nearly 30 years, the production process of all Cody products has been honed into an exact science creating unmatched tone, roll-over and undeniable beauty. The utmost care given to each call is unsurpassed. It is a process that some may imitate, but it never can be copied. Unlike the competition, Cody Turkey Calls is a call designer and quality builder. A very large number of companies in the call industry use computerized C&C router machines or have contractors make the parts to their products. 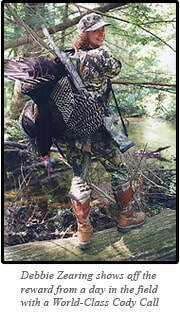 Bill has 45 years of hunting experience and he, his family and entire team are around turkeys nearly every day. The quality of every Cody product shows the care given it and proves that Cody still creates hand-made quality calls the old fashioned way. By hand. In fact, over the years, customers have insisted and begged Bill and the team at Cody to create a box call for the industry. In true Cody style, they have answered. Like the wood pot calls before them, the Cody series of box calls are unmatched in sound quality and beauty, due to the cutting edge engineering technology used in their creation. Much like he did 30 years prior to the wood pot call, Bill has taken the box call to a new level. Cody Turkey Calls is a family run business, and family is an important part of the company. Bill and his wife Debbie have handled the day to day operations since the creation of the company and continue to handle all aspects of the business to this very day. Travis "Cody" Zearing (the namesake of the company) is Bill and Debbie's son and is an active member of the Cody team from production to promotion as is their daughter Shannon. These tight family bonds create an atmosphere unlike some of the large competitors who rush calls through fast manufacturing processes. Each call is special to the Cody Team, a part of their family heritage that they are sharing with an anticipating fieldsman. Generations of hunting families throughout the world know the products created by the team at Cody and want their family to have the best as they share special moments together. Cody calls don't just create unmatched sound quality, for some who have used them, they create memories so special they echo stories from the past.